Tajik Air, the national air carrier of Tajikistan, which is one of the weakest economies within the CIS, has ceased operations after failing to cope with financial difficulties. The collapse of the state-run airline, which has a direct negative effect on the country’s domestic air connections, may compel Somon Air, a more successful private Tajik airline, to review its fleet strategy. All Tajik Air flights have been removed from the timetable of Dushanbe Airport, which serves the capital of Tajikistan, and the airline’s press department has distributed two releases in January, the first of which, dated January 4, reveals that until the end of the current IATA winter schedule in March, privately-run Somon Air will take over those passengers who hold tickets for Tajik Air’s flights to Russia, the CIS country’s key market. The second press release, dated January 10, revealed that the airline’s staff face an unpaid furlough, although Aziz Khairulloyev, the airline’s press secretary, also expressed hope that the situation would change, and that the airline might resume operations on its existing routes. Despite these notices, no representative of Tajik Air has been available for direct comment. Somon Air, in turn, has told Russian Aviation Insider that starting from January 3, it has been operating one daily flight between Moscow and Dushanbe on behalf of Tajik Air. All other routes remain suspended. 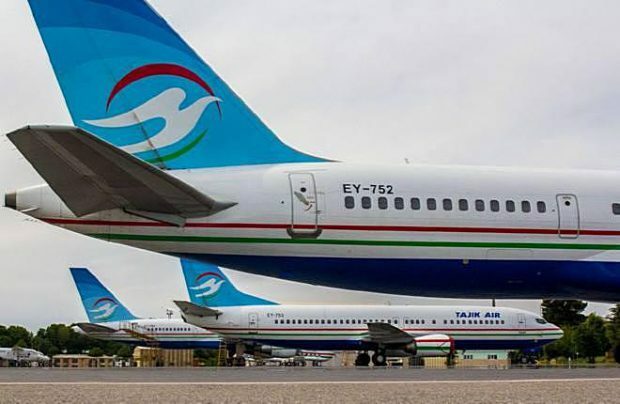 The core of Tajik Air’s airworthy mainline fleet consists of three aircraft with an average age of 28 years: a Boeing 737-300, a Boeing 757-200 and a Boeing 767-300. According to public tracking services, these aircraft operated nil flights in 2019, and it is not clear whether a Bombardier CRJ 200, which arrived in October, had yet entered service with the airline. The main intrigue is that Tajik Air, which also has Antonov An-28 regional turboprops and Mil Mi-8 helicopters in its fleet, is the only provider of domestic air services in a mountainous country with an estimated population of 8.9 million people. So if the airline does not receive state support, it is not clear how these connections can be served because the privately-owned Somon Air (which is providing air services to the country’s president Emomali Rakhmon) does not possess a regional fleet. In the meantime, for those passengers who use Tajik Air’s international services, it is not difficult to find replacement seats, as the airline had no unique routes in its network. It is only a question of time to see how this volume of available traffic – Tajik Air carried 356,000 passengers in 2017 – will be accommodated. Russian airlines are sure to take over part of that market, as Russian destinations were Tajik Air’s primary traffic generators. To benefit from that traffic, Somon Air, Tajikistan’s only remaining operator, will have to revise its fleet expansion plans. It currently operates six Boeing 737s (two each of -300, -800 and -900 types). According to an airline source, its management has already initiated some steps in this direction.